1. Does my paper need a cover page? No. The Modern Language Association (MLA) does not require you to create a cover page when you complete your research paper. If your instructor requires a cover page, simply follow the instructions here: MLA cover page. 2. Should I bold, italicize, or underline my research paper’s title? Your research paper’s title should not be bold, italicize or underline. It should be in the same text as your paper. Visit here for an example, under “the opening page“. 3. Do I have to put my last name and page number on every page? Yes, you must put your last name and page number on every page, including the first page (the opening page) and your Works Cited pages. 4. Do I have to double-space the whole paper? Yes, you must double-space the whole paper, including the heading, the title and the Works Cited pages. Simply double-space everything, but do not add extra spaces besides the double-space. 5. Do I have to use Times New Roman font? The MLA does not require you to use Times New Roman as long as the font you choose is easily readable. 6. How do I handle the citation when one author quotes another? Kagan approvingly quotes Thucydides, who says that Athens acquired this vital site “because of the hatred they already felt toward the Spartans” (qtd. in Kagan 14). In your Works Cited, you include Kagan but not Thucydides. 7. Some MLA citations, such as newspaper articles, use the names of months. Which ones should I abbreviate and which ones should I spell out? Use three-letter abbreviations for all but the short names: May, June and July. 8. Instead of Works Cited, can I use Bibliography? No. The MLA requires your Works Cited page to begin with Works Cited, centered, one inch top margin. Visit here for an example, under #3, the Works Cited page. If you have any MLA format questions, please post them using the comment form below. Take care! How should I cite a foreign reference in an English paper in MLA style? Should I translate the title into English or just write the foreign name? When using copies of online images for your presentation, do you need to cite them on the visual itself, on the works cited page, or both? Whats is the difference and similarities between ‘response essay and Research essay”? What is the difference between a title page and a cover page? How do I cite a program? Does MLA format have to be in third person? What is the proper way to write Washington, DC address that all have a quadrant associated with them? By the way, can I include punctuation in the citations? Can a MLA paper be written in first person and use personal pronouns? What exactly IS the difference between Works Cited and Bibliographies? Layman’s terms, please. How do i cite a picture? For the heading on page one, must the date be formatted day month year? You can use either “day-month-year” style or “month-day-year” style. Whichever style you use, be consistent throughout your paper. I have to include a cover page with my research paper, do I still need to include my full name and title on the opening page? Also, my professor has asked that we include a bibliography, will this take place of the Work Cited page? Please see this page => look under the “Alternate First Page” section for an example of the opening page when you have a cover page. Right, Bibliography is the Works Cited page. Take care! 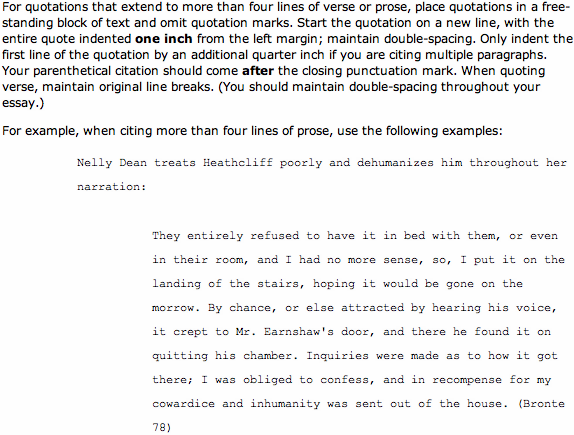 In Microsoft Word, what is the spacing between paragraphs. Short answer: Double-space the entire research paper. Thank you for your reply, it was very helpful! When writing a long quote set off as a block do I need to write it in a smaller font size? And do I have to separate it from the rest of the writing by adding extra spaces? Because I am only pressing the enter button once in order to make it understandable that it is a block set off from the rest of the paragraphs. Thank you for your help! Can I use a question as the title of my paper? Hi Wilson! The title should not be a question. Depending on instructors, you may get a reduced score if you do. If your quote ends in a ? or !, do you put a period after the brackets. ex. “oedipus and willy loman are men!” (luke 1). Is that right or should there be no period? If I am using several sentences in a row that are paraphrased and from the same source and page, do I have to cite each individual sentence or just the last sentence? It seems wrong to have 3 sentences in a row have the same citation. Where can I find the rule about formatting a movie, book, or article title in my paper? I know some are underlined, italicized, or put in quotes. What is the rule? Please visit here => see under the subtile “MLA Format Works Cited Templates”. You can also use a generator to generate the Works Cited list automatically for you. Do the same rules apply for works cited as in the actual paper? My intro includes reference to a movie, an article, a song, and a TV commercial. I’m looking for resources on how I need to differentiate. In your paper, you would use in-text citations. See examples here. The link you provided didn’t answer the question. If a movie title is within the text is it underlined, italicized, and in quotation marks? A teacher has requested the paper in MLA-format and asked for an abstract. My understanding is there is not an abstract in an MLA-style paper, only APA. Can you elaborate on this? If it is acceptable in MLA style, should it appear on page 2, as in APA? You are right, the abstract page is available in APA but not in MLA. If your teacher requires you to have one, it is better to check with him/her for advice to make sure you have your paper done exactly as your teacher’s expect. If your paper has a cover page, placing the abstract page on page 2 looks good. Take care! I saw under FAQs that it is not permitted to use bibliography instead of works cited. I was wondering who came up with that ‘rule’? Bibliography is the proper term to use when talking about works referred to in the paper. A paper in MLA, we must use “Works Cited”. It is a MLA Format rule created by the Modern Language Association. How do I cite lecture notes in my paper and in Works Cited? Class Notes: Lecturer last name, first name. Class Notes. Course. Location. Date of lecture. Lecture: Speakers Last Name, First Name. “Title of Presentation.” Sponsoring Organization. Location. Date. Harris, Muriel. “Writing Labs: A Short History.” 2003 Writing Center Conference. National Writing Centers Association. La Swank Hotel, Seattle. 28 Mar. 2003. I was trying to quote my textbook as the source in my paper and apparently my “citations need fixing”. Did I leave something out? Question: On my first page, do I enter my paper’s due date or the day I turn my paper in? Answer: You enter your paper’s due date, not the day you turn in your paper. Take care.